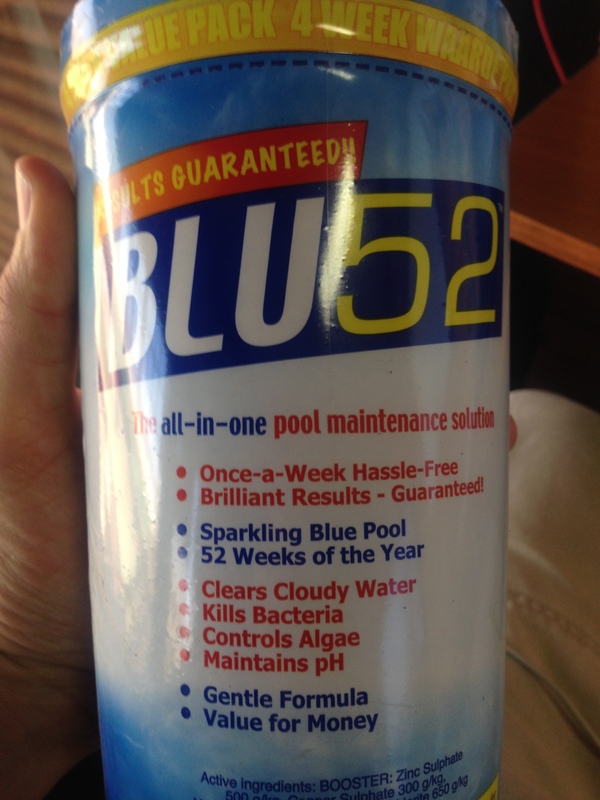 I refer back to my post in February about pools, and what I am using to keep my pool bright and BLU52. I am very impressed with BLU52. I am a loyal Pool Magic user, and it was with great apprehension that I decided to give BLU52 a go. Its slightly more expensive than the Pool Magic, but not enough not to try it. I started to use BLU52, and then the rain came, and it stayed, and it didn’t stop for weeks. So my idea of comparing apples with apples didn’t seem to hold water. I can now say, that during all the rain, and my winter ineffective pool cleaning methods, my pool is still very much … blu. It is as easy to use a s the Pool Magic and, despite challenging environmental circumstances, the BLU52 performed great. I would recommend it any day. Now for the next few months I am going to use hth FLOATER +. Lets see how it goes. Now that all the rain has stopped in the northern parts of South Africa, we can start with general maintenance in and around the house. For me wood always gets the first and most attention, but this year I have decided to make sure that all the steel products gets as much attention. I have seen small bits of rust on most of my gates, and I want to get it sorted this year. First and foremost it is necessary to understand why metal rusts. When bare metal, comes into contact with air and or water a chemical reaction takes place. This becomes evident on the surface of the metal through patches of rust, normally red in colour. This is commonly referred to as corrosion and thus the treatment against it, is anti-corrosion. Now that we know what we are trying to sort out, we can start the preparation of the affected areas on the metal. Clean the metal with a steel brush and then some sanding paper, to ensure that all the rust or corrosion has been removed. Now you can apply an oxide on the bare steel. It is however important to know what was used on the steel previously. If an enamel based product was used, it is important to use an enamel primer or oxide, and if a water based product or acrylic was use, the same base product should be used.The main practical difference between most acrylics and oil paints is the inherent drying time.Oil paints may require the use of solvents such as mineral spirits or turpentine to thin the paint and clean up. An enamel based paint is best applied during the warmest time of the day, allowing for the metal to expand, this will ensure that the enamel does not crack as the metal expands. As for acrylic, the recommendation is mid-morning. Now for the cost of this maintenance project, a 5lt of acrylic oxide will set you back about R350-00 and the solvent based oxide only about R180-00, but if it is a new application, the recommendation is to use the acrylic oxide, because of its dynamic nature. Something about wet treated timber. We discussed CCA treatment as one of the first blogs, but I had a client who had issues surrounding the treatment, and I think it is wise to go through the issue, maybe just to clarify it to myself. Firstly, CCA is a water based treatment impregnated into the wood through a vacuum process, strictly controlled and regulated by the SABS. During this process the CCA is pushed into the timber as a watery chemical. When the correct impregnation is achieved, thus the right amount of CCA for the application, the vacuum is opened and the timber removed from the steam pot – looking cylinder, and according to the regulating procedures, this timber needs to stay at the treatment plant for 24 hours before it is allowed to be collected. This is an important fact, because there is a high possibility that the treated timber that you buy might still be wet from the treatment, and as we mentioned in the earlier blog, timber is allowed to contract and expand, and with the timber still wet, it will contract with up to 10% of its current dimension. As EVERYBODY in Gauteng knows, we have had a bit of rain of late, and with this amount of moisture in the air, the wet treated timber will take up to 4 weeks to dry and settle. There is nothing that can be done to speed up this process. The weight of the timber will also be significantly more than dry timber, thus making transport more expensive. So, if you happened to have bought freshly treated CCA timber, remember to take into consideration that the timber will contract, and it might be wise to wait a little, until our weather has cleared up. Additional sealing of the timber, will also be futile, as the water will push the treatment off the wood, as it tries to escape into the atmosphere. Maybe I am jumping the gun a bit, but winter is coming, and I can’t wait! Red wine, snuggling next to a fire under a blanket, rugby, soups and Eskom threatening to put us all on load shedding schedule. Well this year it will be less of an issue for me, because I decided to get a closed combustion fireplace. The allure of having a fireplace in the house has always appealed to me, but I don’t want the smell of the smoke, and the possibility of somebody falling into an open fire has always scared me away from fireplaces. The threats from Eskom last year, and the few times the power did go off, pushed me over the edge, and I did some research. I wanted to heat up our living area and open plan kitchen which totalled about 70m2, without hanging myself with the electricity bill, and after getting quotes from various fireplace manufactures going up to R45 000 – 00, I decided on the BOSCA 360 manufactured by Megamaster, and of course bought at Noag’s for about R11 000 – 00 including the flue kit and insulation. This monster delivers 5.81kw/h (not sure what that means) and heats up 40m2 – 80m2. The quality is great, and although it has not been cold, I decided to burn the fireplace, just to get a feel for it, and it gets very hot, very quickly. Firewood goes for R20-00 for 20kg and the guy’s recon I will use about two bags a week, but let’s see, I like red wine. Fireplace are now, for me at least, a real option to beat Eskom and the winter. So come on June and July, come on Cheetahs, come on Bokke, I can’t wait! To build a pool, or not to build a pool, that is a silly question. In South Africa we are blessed with some of the greatest summers in the world, and having a pool on your premises can be a blessing and a curse. A pool needs constant attention and love. I think that most people, me included, don’t give the necessary attention to our pools. I decided to start using various products on our shelves for six months at a time, to compare cost and ease of use. 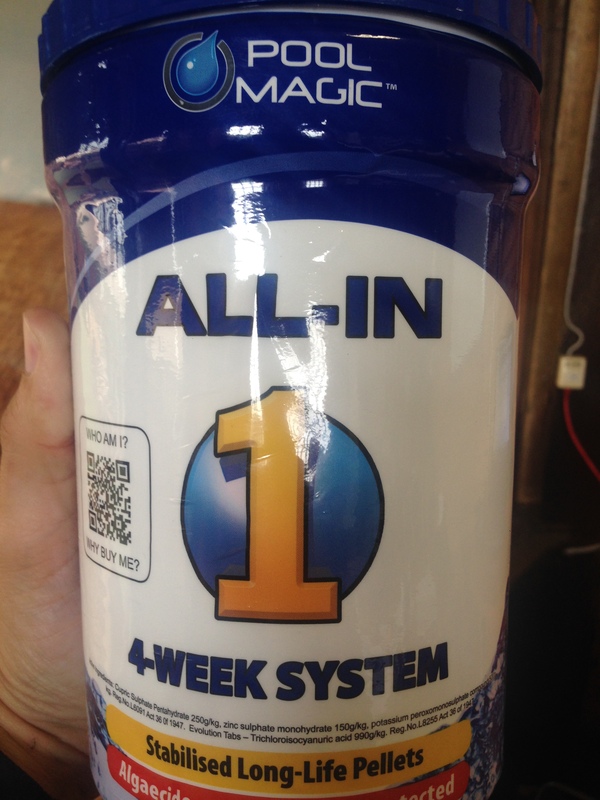 I am all about easy, and I have found a product that takes the work out of looking after your pool called Pool Magic All-In 1. Retailing for around R100-00 per container, which should last for a month, the cost is not too bad either. It comes in a neat plastic container with 5 sachets, four weekly chlorine tablets, and one monthly sachet with various chemicals. It is easy to use, store, and my pool has never looked better. Now I am not your regular pool expert, but I can recommend this product to keep your pool in good condition, with little effort and at a good budget. From February I will be using Blue 52, and I endeavor to report back in due time. The first few summer afternoon showers has fallen in Jo’burg. The grass and trees are turning green. It’s a great time to be in Gauteng. This is also the time when roofs start leaking. Damage caused by the sun, hail and a lack of care, all contributing to a common problem. The most frequent problem areas seems to be parapet walls and valleys, which guides the water off roofs. Even if a roof was properly sealed, and has not given any problems in years, the chances are that, at some stage, it needs to be resealed. As with all recoating DIY projects, the most important step is the preparation of the surface that needs to sealed. As far as possible the surface needs to be stripped from old applications, because sealing on top of a problem will just create an even bigger problem. When preparing a parapet wall, the condition of the plaster needs to be assessed. A dusty, unsure plaster surface needs to be bonded, using a bonding liquid, such as Prominent Bonding Liquid, this should retail for around R185-00 / 5lt. When the surface of the parapet has dried, a simple application of Flash Harry Liquid Plastic, R260-00 / 5lt, will be sufficient. For the correct application of any product, please consult the container or the salesperson that helped you. Liquid Plastic needs to be applied horizontally and vertically, making a waterproof mesh on the parapet. It is also important to go down the wall, approximately 100mm each side, with the product that you choose to use. After curing for around 7 days, depending on the weather, the liquid plastic can be painted to match your exciting colour. Although a damp parapet wall can seem to be a major issue, the solution is quite simple, and using the correct preparation methods and the right product will ensure that you can enjoy the summer in the pool, and not on the roof. As important as it is to seal a deck, furniture or any timber exposed to the elements, so important to use pre-treated timber for any outside project. A variety of treatments are available on the South African market, the most well-known would be CCA and creosot. These products are used by saw millers, who treat the wood under pressure, to achieve impregnation of the wood by the chemical. These saw millers are registered treaters, and carry the SABS or SANS mark, which is displayed on the timber after it has been treated. We hold stock only of the CCA treated timber, as it is more user friendly than creosot. 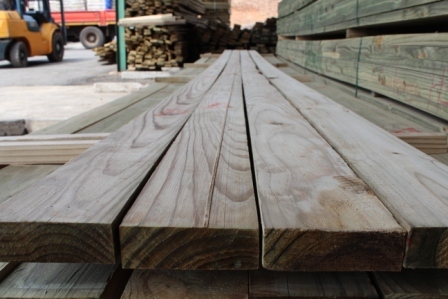 The CCA treated timber has a light green colour and is odourless, and creosote treated timber has the distinctive oil smell and is black in colour. So why is this important if you are going to seal the timber in any case? Surface applied sealants has no penetration and needs to be redone often. They protect against weather elements and not against rot or termites. Treatments such as CCA impregnates the timber, and bonds with the fibres of the timber, protecting the timber against rot and termites. It is important to ensure that you use the right treated timber for the right application. Make sure that the contractor that you use to install that new deck or lapa for the holidays, use treated timber, bought from a reputable reseller.